Lovebug truffles are adorable ladybug-shaped truffles decorated with hearts. These cute critters are perfect for Valentine's Day, or any other romantic occasion. 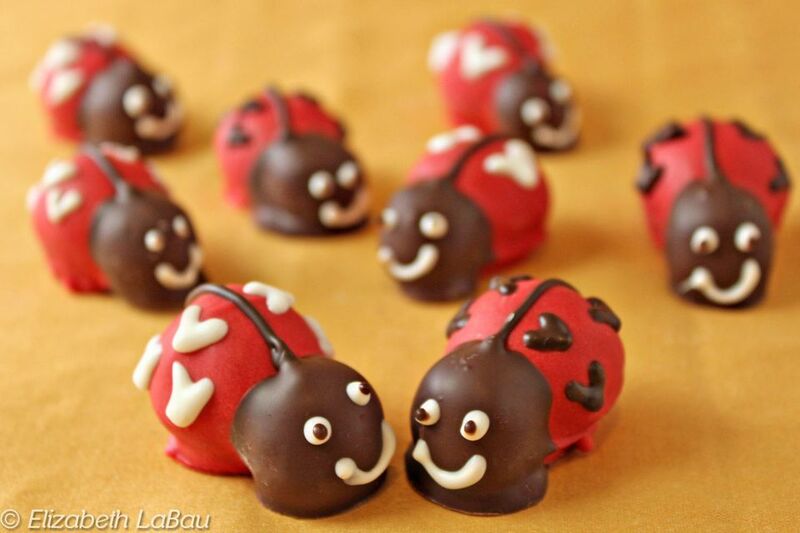 Of course you can make regular ladybug truffles by simply replacing the hearts on their wings with spots. First, prepare the ganache: place the chopped chocolate in a medium bowl, and set aside. Pour the heavy cream into a small saucepan over medium heat, and bring it to a simmer. Once the cream is near boiling, pour the hot cream over the chopped chocolate and let it sit for one minute to soften the chocolate. Gently whisk the cream and chocolate together until they're a smooth, homogenous mixture. Press a piece of cling wrap to the top of the ganache and when it is room temperature, refrigerate it until it is firm enough to scoop - about 2 hours. Once the ganache is firm, cover a baking sheet with waxed paper or foil, and dust your hands with cocoa powder. Use a small candy scoop or a spoon to form the ganache into 24 small, 1-inch balls. Roll them between your hands to get them round, and keep your hands dusted with cocoa powder to prevent sticking. After you've formed 24 truffles, you should have ganache left over. Make 24 more balls about half the size of the first set—these will be the ladybugs' heads. If you have extra ganache left over after making the heads, form more ladybugs until you've used all the ganache. Melt the chocolate candy coating in a small bowl. Dip the tip of one of the smaller balls into the coating, then press it against a large ball to glue the head to the body. Hold it until the coating sets, then repeat until all of the heads are glued to the bodies. If your truffles are starting to get soft and warm, refrigerate them until they firm up. If they are still firm, proceed to the dipping stage: melt the red candy coating until it is smooth and fluid. Using forks or dipping tools, dip a lovebug until it is completely coated in the red, then take it out of the coating, letting excess drip back into the bowl. Replace it on the foil-covered baking sheet and repeat until all of the lovebugs are dipped. Let them set at room temperature or harden in the refrigerator. If the chocolate coating has started to harden, re-melt it in the microwave, then pour some into a paper cone or piping bag fitted with a small round tip. Starting at the "neck" area where the head joins the body, pipe a vertical chocolate line down the center of the body to form the lovebugs' wings. Repeat until all of the lovebugs have wings. Pick up a truffle and dunk the head into melted chocolate coating, so that the body remains red but the head is now brown. Replace the lovebug truffle on the baking sheet and repeat until all the lovebugs have chocolate heads. Now it's time to decorate! Melt the white coating and pour it into a paper cone or piping bag fitted with a small round tip. Give the lovebugs eyes and a smiling mouth. Pipe small hearts on their wings, or you can make plain ladybug truffles and pipe dots on the wings instead. You can also use the paper cone of chocolate coating to pipe on chocolate hearts or dots. Be sure to go back and place a small chocolate dot in the center of the white eyeball so your lovebugs have pupils! Once all of your lovebugs are decorated, place them in the refrigerator to set the chocolate before serving. Lovebug truffles can be stored in an airtight container in the refrigerator for up to a week. For best taste and texture, bring them to room temperature before serving.